Red Carpet in Cannes for ZAPPWARE winning the User Experience Award for WIND-Hellas new TV service. Cannes, France – 15 October 2018. 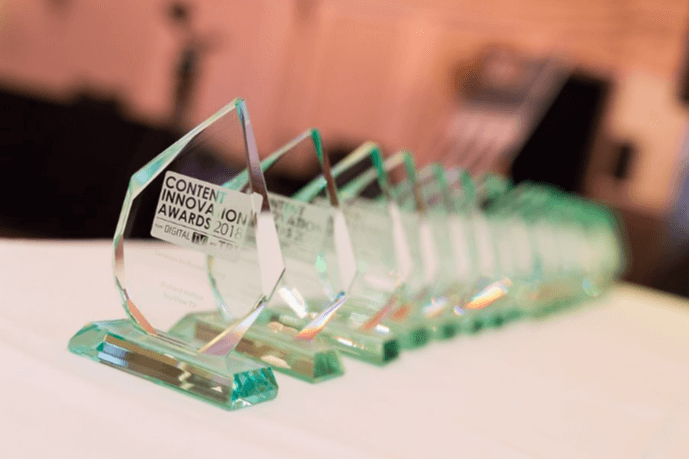 During the Content Innovation Awards held in Cannes yesterday night, ZAPPWARE won The UX Award for its commercial deployment for WIND Hellas in Greece. Patrick Vos, CEO of Zappware explains: “Telecom operators want to stay relevant towards their end-users with their entertainment value propositions. With Zappware, our mission is to provide them with the right solutions to turn their viewers into more loyal consumers spending more time and money with them. It has been a significant effort to design, develop, test and validate the right user interface, combining linear and OTT in a perfect symbiosis. The NeXX 4.0 solution-suite includes the visible part, that is the multiscreen user interface and the part that is under the hood: our back-office with operator tools. An important tool is the NeXX 4.0 marketing console, enabling marketeers and content teams to manage the user interface to bring relevant personalized content and up-sell triggers. Great that not only the telecom operators are excited to source the solution, also their end-users love the solution. “We launched WIND VISION before the summer this year and got great end-user feedback so far. We were the first integrating Netflix with a state-of-the-art multiscreen video solution. Android TV and the Zappware cloud back-office running on Amazon AWS have been accelerating factors in terms of platforms used. The key differentiating factor however, was Zappware’s user interface. It is great to be part of this success story in winning The User Experience Award with them”, said Hermann Riedl, Chief Strategy & Digital Transformation Officer of WIND Hellas. AMSTERDAM, The Netherlands – 18th September 2017. DevWerks is excited to announce its partnership with Zappware to bring a customized version of the Nexx 4.0 UX/UI to the United States. DevWerks will be launching its TV as a Service (TVaaS) platform in the United States in 2018. 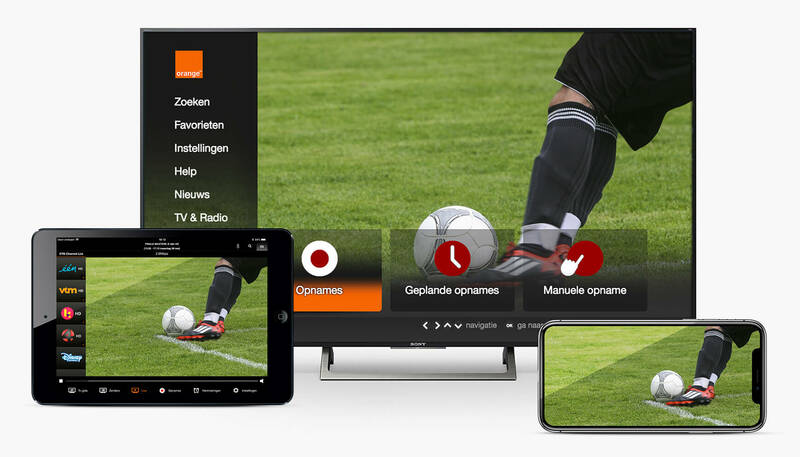 “I’m proud to be able to announce this news at IBC at the RAI in Amsterdam: since the launch of our new NeXX 4.0 user experience, we’ve got good traction from the market and are now taking a big step along our growth journey. Entering the US market is a substantial extension of our international footprint. 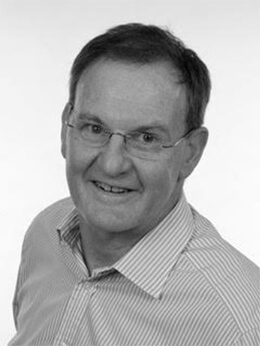 Zappware’s back-office enables Service Providers to customize the user experience, features, up-sell campaigns etc… in a cost-efficient way”, explains Patrick Vos – CEO of Zappware. DevWerks based in Phoenix, Arizona brings an executive team with over 50 years of industry experience. With a startup mentality DevWerks seeks to bring rich content and services to undeserved markets throughout North America. ATHENS, Greece – HASSELT, Belgium – 20th February 2017. WIND Hellas announced today that it will cooperate with Zappware to offer high end TV services to its customers. Thanks to Zappware’s turnkey technology solution WIND Hellas will launch a new multiscreen video service by the end of the year, bringing a totally new TV experience to WIND’s end-users. “Our goal is to offer our customers a unique TV experience both in terms of technology and content. To this end we are partnering with top tier providers with a proven track record of success, such as Zappware. The state-of-the-art cloud-based video solution we have chosen is simple to use, fun and personalized. It’s a high end technology solution that along with the content that WIND Hellas will secure, will bring a new way of entertainment to our customers no matter where they are, no matter which device they will be using”, said Hermann Riedl, Chief Strategy & Digital Transformation Officer of WIND Hellas. “We are proud and excited to deploy our cloud-based TV solution for WIND Hellas. WIND and the majority of telecom operators we talk to, tell us that they require a platform to really engage towards their customers, create loyalty and trigger users to enjoy all the available content. Now, here is the challenge: there is a lot of very valuable content ready to be consumed, but how can viewers easily find their favorite TV shows, movies and series? Our NeXX 4.0 turnkey video solution is the Zappware answer to that challenge”, said Patrick Vos, CEO of Zappware. 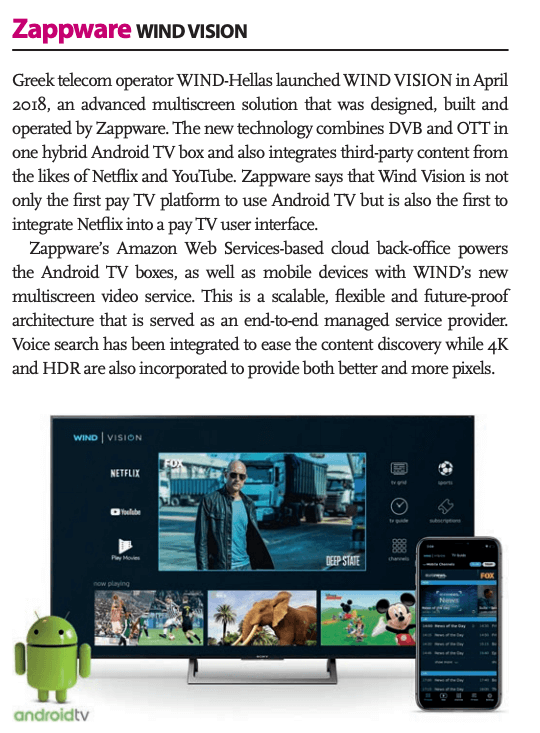 Zappware is deploying a turnkey solution reaching from video head-end infrastructure, cloud-based “back-end” including the personalization capabilities until the “front-end” client software for Android-TV set-top-boxes, smartphones, tablets and web-browsers. The whole video-chain is provided and managed by Zappware. The features include linear and catch-up TV, network recordings and a rich Video-On-Demand (VOD) catalogue. Along with the cloud-based back-end, the Android-TV set-top-box platform offers a lot of flexibility to integrate third party content and applications to end-users in one seamless experience. WIND Hellas was founded in 1992 and is one of the largest telecom operators in Greece, offering a full range of telecommunications services: from fixed-line and mobile telephony, broadband services and ICT solutions. WIND is a heavy investor in new technologies and infrastructure in Greece, having invested over €3bn over the years. Its current investment plan is primarily targeted at new generation networks such as 4G, 4G+, VDSL, FTTx. WIND operates the fastest growing 4G mobile network in Greece currently covering almost 80% of Greece’s population, targeting 100% in 2018. Zappware is launching at IBC – Amsterdam – 9-13 September – it’s all new Video User eXperience. The concept is straightforward: Let’s make it simple again and user-centric. 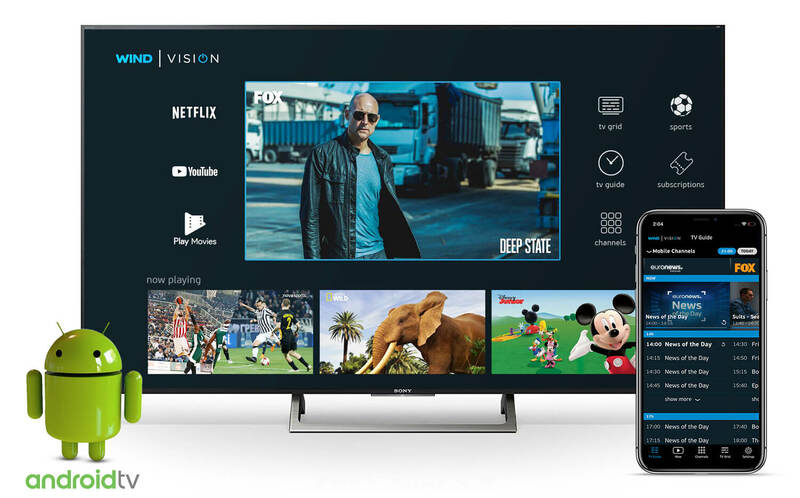 A Video Solution knowing you, predicting your next viewing pattern across your channels, recordings, catch-up TV items and that lets you access and share your content across devices and set top boxes. 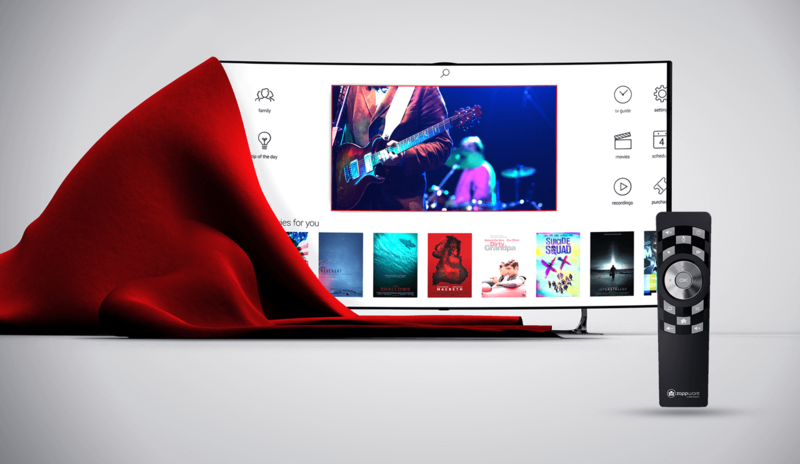 The NEXX 4.0 user interface is a dynamic environment that adapts itself in a self-learning way according to the end-users behaviour, across the linear and on-demand content consumed and across devices. Analyzing customer behavior, building up a customer DNA and using the video user interface to communicate back to the user by recommending relevant quad-play packages and reduce churn is Zappware’s way, powered by it’s Service Delivery System, to “close the loop” and turn viewers into consumers. 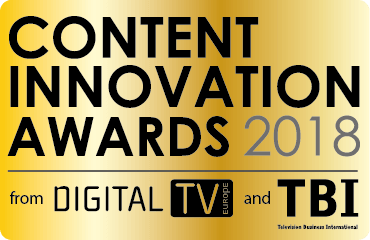 Zappware uniquely combines creativity and technology into powerful digital TV products for pay-TV operators. Its proven Zappware platform currently serves millions of devices around the world, and provides an intuitive and personalized multi-screen TV experience across set-top boxes, connected TVs, smartphones, tablets and PCs. It includes a unified Service Delivery System that allows the operator to monetize the service on cable, satellite, terrestrial, IPTV, OTT and hybrid networks. With its Zappware Design custom user experience service, Zappware also designs full custom user experiences, which can be custom built on top of the Zappware platform or on custom environments.